It must be very frustrating being a French consumer these days. Every other day, a new supermarket chain publishes a press release of yet another technological first that will revolutionize your shopping experience, yet when you actually try to use the new service, reality sadly does not live up to the hype. Are these Parisian pilots a microcosm of the current failings of NFC globally? Our French correspondent tried out the latest NFC deployments on offer in Paris by supermarkets Casino, Carrefour and Leclerc, in an attempt to see how customer friendly the roll-outs truly are. 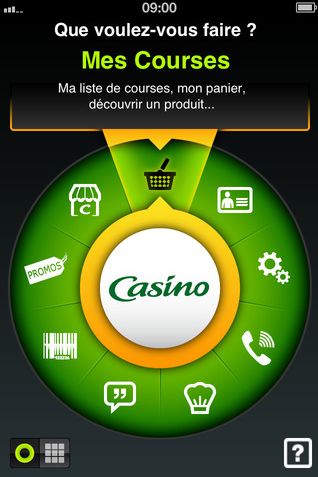 Heralded as the “first NFC-enabled supermarket in the world,”the Les Belles Feuilles** Casino** in the fashionable 16th arrondissement of Paris reportedly allows customers to use themCasino NFC app for a variety functions, including scanning items to a virtual basket housed within the app. This allows customers to manage their budget in real time, and speeds up the checkout process (as you only need to tap your phone to an NFC reader attached to the store’s cash register, rather than scanning individual items, with payment undertaken by traditional methods of card, check or cash at the till). The mCasino NFC app also reportedly provides nutritional and pricing information about the items on offer, allows for personalization of the app to reflect customer preferences and buying habits, and provides a virtual store loyalty card and promotional offers. A demonstration at the mini NFC Casino store at the CARTES exhibition by Tim Baker of Think & Go NFC seemed to validate the ease of use of the app and its various offerings. Once you leave the safety of a trade show, however, the stark reality of an NFC rollout includes some implementation hiccups. During a recent visit to the store, there was absolutely no signage concerning the NFC roll-out, leaving many consumers unaware that they could use NFC as they shopped. Further, the pilot currently only works for iPhones, which are not NFC-enabled and require consumers to borrow an NFC case. Most importantly, the NFC tags themselves often did not work or were non-existent for certain products such as fresh produce, forcing consumers to alternatively scan barcodes or even manually enter the data. Further, given the current state of implementation, the roll-out to Android and Blackberry and the potential to pay by phone at checkout seem to be much further away than recent press releases would lead one to believe. Although the service is currently only being rolled out to customers registered for a loyalty card as an alternative to the current self scan service, and thus a potentially a more forgiving audience, it is questionable whether the app, in its current implementation, truly facilitates the customer experience. Next stop on the NFC roll-out survey was** Leclerc** at the brand new So Ouest luxury shopping center. Although there was some customer signage detailing use instructions and features of the NFC Hyper Levallois application (available for iPhone and Android), staff themselves were ill-informed of the deployment, with one of their representatives claiming that it did not work yet due to lack of network (huh?). This aside, once the application is downloaded via a QR code scan and a profile is created, customers are able, either through scanning NFC tags or barcodes, to access nutritional, fabrication and pricing information concerning all Leclerc branded products. This enables customers to obtain alerts on allergies and specific dietary needs based on one’s customer profile (these are drawn from an independent Shopwise database, with customers requested in all cases to verify the packaging.) Adding products to a virtual shopping basket also allows for real-time budget management and shopping list creation for future purchases. One caveat – no NFC cases are available, so many users currently are forced to use the barcodes and, interestingly, even when a virtual basket is created, there is no option currently to use that basket to speed up check out, let alone to pay. Which begs the question, what exactly is the point of this application other than to advertise Leclerc’s wares? Last stop on the NFC tour was Carrefour City’s St Lazare store. Rather than provide NFC tags to give further information to customers, the Mon Panier application allows customers to order groceries online or via a mobile app (on Android and iPhone) and then, in theory, to seamlessly pick up their groceries and pay upon arrival to the store. Using a QR code or NFC tag to identify themselves and pay at a dedicated cashier, consumers are promised a quick and pain free shopping experience. In reality, however, although the mobile ordering and registration process was user-friendly, there were still kinks in the process when it came to picking up the ordered goods. Having never received the confirmation email/SMS that my groceries were ready (though the app guarantees pick up in less than 2 hours), a visit to the store was equally unfruitful, with the QR/NFC scanner being out of order (seems the florist had pulled the electrical plug!) and when an appropriate staff member was eventually found, it turned out they had never received my order due to a technical fault! The store offered to make up my order then and there, explaining I am only the second person to whom this has happened, but the experience left me with a bittersweet taste on the ease of the application. Overall the current NFC shopping experience is disappointing; French supermarkets are in a race to claim they have the most up-to-date technologies (even supermarket G20 has launched a new mobile app that allows, in addition to the creation of a virtual basket and payment via mobile, 3D visualization of products), but the technology so far has not yet been sufficiently tweaked to create an ease of user experience for the customers that is persuasive. “Felicitations” for trying, but there’s still a lot of work to do to win the NFC supermarket market wars. Has The Time Come for NFC Mobile Payments?